SailorBags sailorbags.com recently introduced resort-ready bags designed to safely and comfortably carry everything from smartphones and tablet PCs to beach accessories and sporting gear. New 2011 sailcloth styles—ranging from $15-$79—include a computer bag, wristlet, lunch sack, stow bag and more. “Like a passport, comfortable gear should be a top priority when packing or planning for a trip or excursion. Our new sailcloth products for spring incorporate the feedback our customers continually share—they’re functional and affordable, but ready for adventure, travel and fun,” said Anne Zimmer, president, SailorBags. * Style with the Substance: Trade in the bulky wheeled black suitcase for a unique, stylish and resort-ready bag—you’ll never overlook your items in the airport terminal again. All products are waterproof, washable, stain resistant, and UV protected to stand up to any sport or activity. Make it personal by adding your own custom embroidery or corporate logo. * Throw and Stow: Originally designed to meet the tough standards of sailors, SailorBags are indestructible. Pack a large or extra large duffel with a whole week’s worth of clothing and scrunch it in an overhead bin. Toss in a Stow Bag (available in three different sizes) for fast and easy loading of scuba, surfing and sporting/beach gear or use as a laundry bag. Suggested retail price: $39-$85. * Great for the Gadgets: Choose from the Computer Bag, Family Electronics Bag or Messenger Bag to safely transport tablet PCs, iPads, smartphones, digital single lens reflex (DSLR) cameras and other family electronics to the boat. Suggested retail price: $59-$75. * Keep it Cool – or Hot: Insulated CoolerBags or lunch bags keep drinks and lunch cold (or your hot soup hot) all day long. Product sizes and styles vary to accommodate a small picnic or large fête. Suggested retail price: $34-$75. 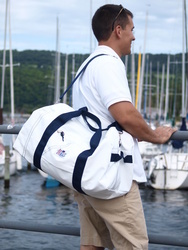 The full line of SailorBags can be personalized for any individual, business, retail store, college, or sports club. They make ideal corporate gifts for colleagues and customers, as well as perfect promotional gifts or regatta trophies.